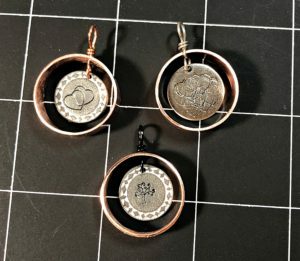 It’s time to take some poorly stamped blanks and make slightly better looking copper pipe pendants out of them! Are you ready? 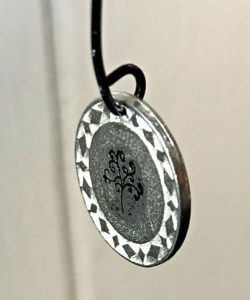 If you don’t remember the whole ordeal that was my first experience with metal stamping, you can find that here. 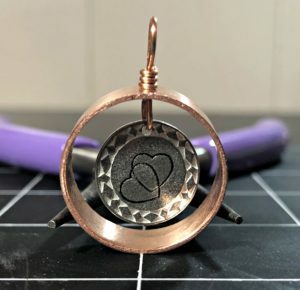 TL;DR – if there wasn’t such a thing as a “rage pendant” before, it exists now because I made one. Setting aside the dramatic process of rage jewelry making, sometimes things work out beautifully! 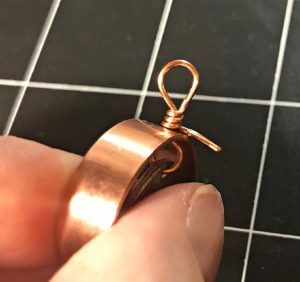 It just so happens that those little blanks are the PERFECT size to dangle inside a slice of copper pipe. 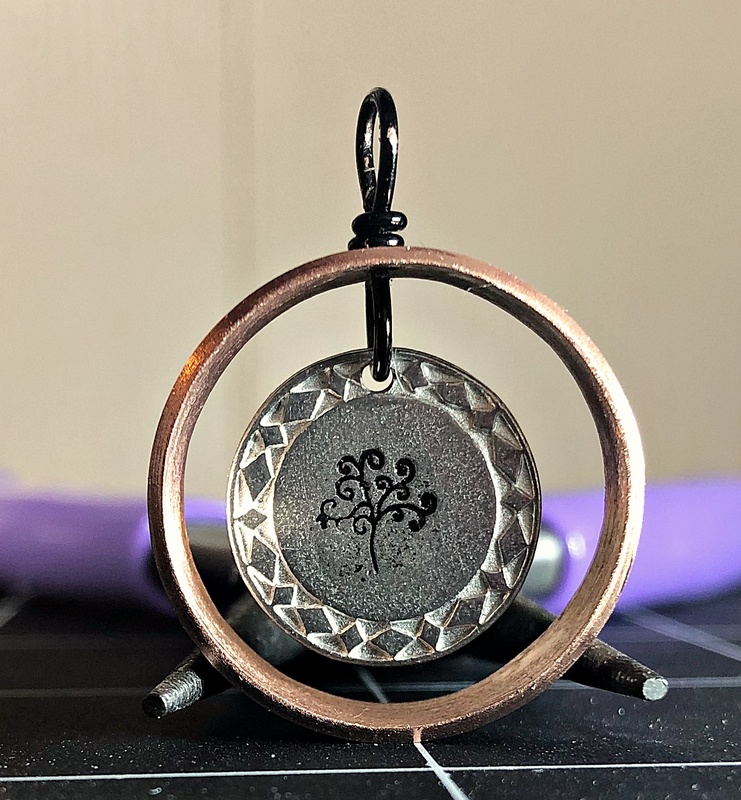 I started out with the Tree of Life piece since it came out the closest to some sort of reasonably good usable impressed upon metal. What do you call a stamped blank anyway? Is there a word for it? Or is it just a stamped blank and that’s it? Well the tree was kinda good and I like the design, so I snipped a bit (too much) of black wire. I thought it would look good with the design, and it does, but there’s one problem with black craft wire. It is SO easy to get tool marks on it and then you’re left with very noticeable copper spots. It also makes me wonder how long the black will last on the wire, but this was an experiment, so perfection was not necessary. I kept the natural curve of the wire after the loop to go with the design. 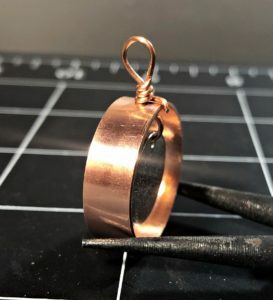 I took a slice of copper pipe with a hole drilled in it and threaded the wire through. 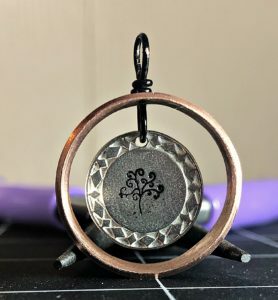 A quick loop and a wrap later and it became a pendant! I like how this wrap looks, but it doesn’t prevent the pipe from spinning around the blank. I think that might be okay (like a “feature”) for some pieces, but in this case I’m not wild about it. Pliers make a great prop for stubborn jewelry that won’t sit still. Round two! This time I wanted to fix the spinny pipe problem, so I started this piece the same way as the first, but finished the wrap a little differently. I gave it a little “tail” to bend down over the back of the pipe. At first I tried to bend the wire on itself to give it a more finished look and to keep it from having a cut wire sitting against the wearer. The only problem is that it rarely ever occurs to me to measure things when it comes to wire wrapping. No big deal, right? Eyeballing it is totally fine! Eyeballing it did not work this time around and my tail was waaaaay too long. Since you can’t really unbend a wire that’s bent in half (well, you CAN, but it will most likely break), I had no choice but to cut it. By the way, eyeballing it totally worked that time and that tail did its job. No more spinny pipe pendant! Are you ready for the finale? The rage piece got a little extra experimentation. Instead of drilling a hole for the wire, I decided to wrap the blank onto the pipe. That way it saves me from drilling a hole and the pipe won’t spin. It’s also because I thought I drilled three pieces of pipe, but apparently only did two. Oops! The question now is: leather or chain? It might need a little tweaking, but it’s not too bad! The wrap also gives the rage stamps the subtle air of suffocating angst. (Was that too much?) This might be the one I wear myself! All in all these were a lot of fun to make! 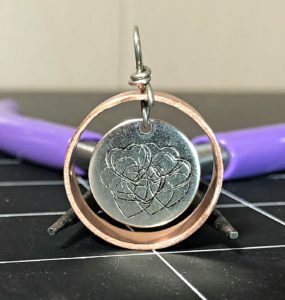 If I can get my stamping technique on point this could be a whole other line for my shop. But what do I call them?? There will definitely be more of these coming with more precision and less frustration! If you have an idea that you want me to try, let me know in the comments below or find me on Twitter.